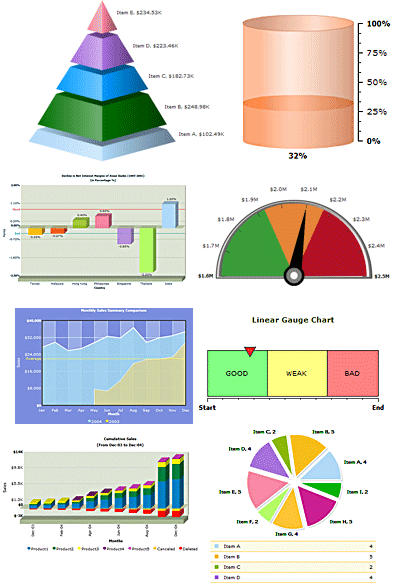 SmartCharts uses charts, graphs and KPIs (Key Performance Indicators) to provide you instant snapshots of vital business metrics, helping you visually improve the communication of business information and keep your finger on the pulse of the business health of your enterprise. Integrate SmartCharts into WebSmart, Nexus, Clover, Presto and any of your existing IBM i, PC or Third Party apps. SmartCharts gives IBM i users the advanced modern tools to visually analyze information and better react to business conditions. And best of all, BCD includes SmartCharts with our solutions at no additional cost. WebSmart - IBM i Web Application Development Tool - easily build powerful, sophisticated data analysis web apps that present summary results in charts, graphs or gauges. Launch in browsers and/or integrate with BCD's Nexus portlets or ECM. Nexus - Portlets to include any dashboard or KPI, based on spreadsheet data or IBM i data from legacy apps, Clover or WebSmart apps. Include these in Nexus ECM (Enterprise Content Manager) to provide controlled, organized access to KPIs. Clover - End-user Query Tool for Web Reports and Queries - use templates and wizards to produce charts, graphs and gauges that depict IBM i summary data with no programming required. Launch in browsers or include in BCD's Nexus portal. Presto - IBM i Web Enablement and Modernization Tool - rapidly transform your green screens into rich PC and mobile web apps without source code changes (no source or recompiling required).